Alena Telford: Barok's Exodus by William L.K. 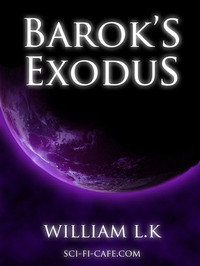 Barok's Exodus by William L.K. Barok's Exodus is the second book in science-fiction series, The Stritonoly Chronicles. Following its prequel, The Eye Of The Storm, Barok's Exodus picks up six years later, as Barok, the Acidel leader, begins to question his existence and his blind faith. Feeling like he is missing something, Barok decides to escape his enslavement and begin a quest that will bring meaning to his life. Acidels are the slave race of creatures whose sole purpose is to mine the purple Purock that is found on the planet of Stritonoly. They do not question or try to advance themselves in any way and when Barok begins to "think", he does what no other Acidel has done before him, he leaves behind all that he has ever known in search of the answers to his questions. However, what Barok is about to find is something more than he bargains for and he must make a choice that will enhance his survival or eliminate him. When the officials are finally notified the guards are sent out to return Barok, there are many who wish to use him in their power struggles and their trail leads them to the forests of the Spiderons, a deadly spider like creature who will stop at nothing to eradicate the humans from the land. This cunning race of creatures have their own agenda, who will survive as the Spiderons launch an attack on the unsuspecting warriors?? Princess Becki continues her manipulation in Barok's Exodus even as she is kept captive and under tight guard away from the citizens of her land. Suffering from a split personality, Becki's character has only strengthened the plot, as your left wondering her new angle and the surprises that are sure to unfold. And underneath all this plot is another sub-plot, one we watch get closer and closer to the unsuspecting inhabitants of Stritonoly, will it be their ultimate demise or will a saviour be found in time to save them all?? The story continues six years in the wake of the night of treachery and the greatest storm the planet of Stritonoly has ever witnessed. Princess Becki has grown in these years. She learns that her powers over the men that hold her captive may bring her what she has been waiting for, perhaps for longer than she herself realises. As the story unfolds, the characters discover truths about themselves, some terrifying, others prophetic. Here from the Boost Your Buzz. Would love it if you checked my blog out! Have a great night.